A New York Times editor on Sunday said the paper regrets how much a controversial article about a white nationalist offended readers. The memo, written by national editor Marc Lacey, was an attempt to address backlash to a piece posted online Saturday. 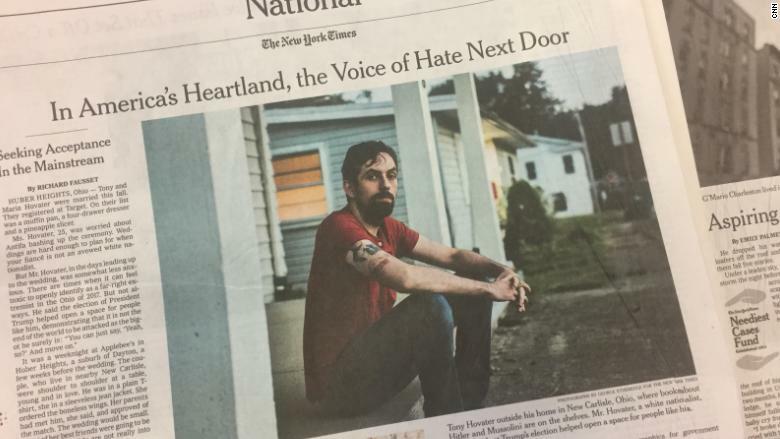 It describes an Ohio man as "the Nazi sympathizer next door." "We regret the degree to which the piece offended so many readers," Lacey wrote. "We recognize that people can disagree on how best to tell a disagreeable story. What we think is indisputable, though, is the need to shed more light, not less, on the most extreme corners of American life and the people who inhabit them." He continued: "That's what the story, however imperfectly, tried to do." The story describes the everyday life of Tony Hovater, a man who identifies as a white nationalist. It discusses his wife, his "innocuous pop-culture" tattoos and a love for TV comedies like "Seinfeld." The piece was criticized by people who called it an attempt to "normalize" white nationalism and other extremist ideologies. Quartz culture editor Indrani Sen said the story lacked "any explanation to the reader of why exactly this story exists, and what the writer expects the reader to glean from it." "Without that we have, essentially, a puff piece about a Nazi sympathizer," Sen wrote. Lacey offered an explanation in his memo. "The point of the story was not to normalize anything but to describe the degree to which hate and extremism have become far more normal in American life than many of us want to think," he wrote. He also said the article refers to Hovater as a "bigot" and a "Nazi sympathizer who posted images on Facebook of a Nazi-like America full of happy white people and swastikas everywhere." Lacey added that editors and the story's author, Times reporter Richard Fausset, "agonized over the tone and content of the article." Fausset also wrote a 700-word column that described his reporting process. It was published Saturday alongside the original article. "There is a hole at the heart of my story," he wrote. "Sometimes a soul, and its shape, remain obscure to both writer and reader. I beat myself up about all of this for a while, until I decided that the unfilled hole would have to serve as both feature and defect." Asked for additional comment, a Times spokesperson directed CNNMoney to Lacey's memo. Hovater did not respond to a request for comment. Charlie Warzel, a BuzzFeed reporter who writes about online culture, published a response to the Times piece Sunday. He suggested that some corners of the internet might explain Horvater's point of view. "The Times piece does little to describe the online ecosystem that has helped white nationalists, neo-Nazis and the Alt-Right organize, amplify its message, and thrive in recent years," Warzel wrote. "And, simply put, any attempt to answer what exactly led Hovater to 'gravitate toward the furthest extremes of American political discourse' is incomplete without it." Not everyone was so critical. Ira Glass, the host and producer of the popular radio show "This American Life," said the article "captured something real and worth documenting." "Yes, the reporter could've argued with him more," Glass tweeted. "On our show we'd have done that. But I think it wouldn't change the overall story here very much."